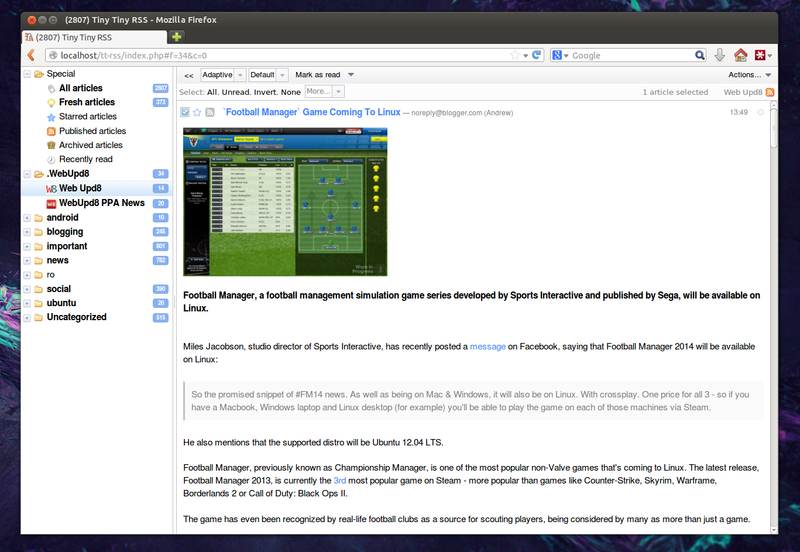 A while back we wrote about installing and configuring Tiny Tiny RSS in Ubuntu, a Google Reader (which will be closing in July) alternative that you can host on your computer / server, but the version available in the Ubuntu repositories is pretty old, so I've uploaded the latest Tiny Tiny RSS version to a PPA, which should make it a lot easier to install in Ubuntu 14.10, 14.04 and 12.04. At the time I'm writing this article, our PPA has Tiny Tiny RSS version 1.7.9. Update: the PPA is constantly updated, so now it provides Tiny Tiny RSS 1.14. Since version 1.6.2, there have been many changes, like interface and typography improvements, error logging, new plugin system that includes plugins such as importing starred/shared.json files from Google Reader takeout or emulate Google Reader keyboard shortcuts and others, improved feed update speed, implemented basic password recovery and many other new features, tweaks and bug fixes. The PPA packages are the work of Sebastian Reichel, who is maintaining Tiny Tiny RSS for Debian. I've just tweaked the package to work with the latest Tiny Tiny RSS and uploaded it to the PPA. perform upgrade on database for tt-rss : select "yes". you'll need enter the full URL of you tt-rss installation (for instance "http://localhost/tt-rss/" for a local install). (if the first one fails, don't worry, it just means the symbolic link was already created by Tiny Tiny RSS). and in this file, scroll down to "define('SELF_URL_PATH', 'http://example.org/tt-rss/');" and replace "yourserver" with your server address, or use "localhost" if you only plan on using it locally. Then save the file and exit (to save and exit in Nano text editor, press: CTRL + o, ENTER then CTRL + x). Update: this step doesn't seem to be required any more since the initial config now writes the correct address in this file, but I'll leave it here just in case. and in this file, change "DISABLED" from "1" to "0", then save the file and exit (to save an exit in Nano, press CTRL + o, ENTER then CTRL + x). You only need to run this command once, the tt-rss daemon should start automatically on each system startup. Then, change the password (!) 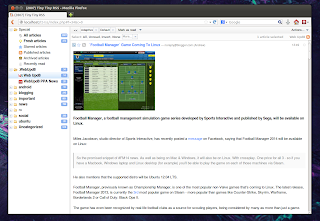 and start importing your Google Reader feeds or add some feeds manually.